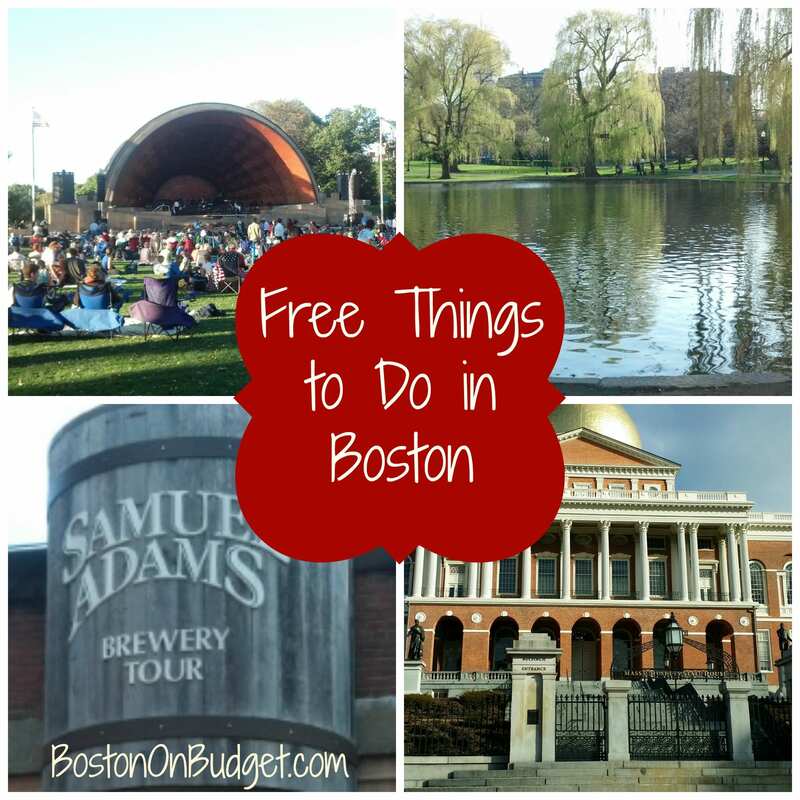 There are so many great things to do in Boston that are completely free! Whether you are visiting Boston for the first time or have lived here your entire life, there are so many wonderful and affordable things to do! If you are coming to visit Boston, don’t forget to check out Boston Visitor Guide, Top Things to See in Boston on Vacation and my Discount Attractions page which lists so many discounts to popular Boston attractions! Also, check out 7 Free Tours in Boston and Free Museums by Every Day of the Week if you are looking for more free things to do in Boston! The Freedom Trail is a 2.5 mile, red-line route that leads to 16 historically significant sites. Many of the historic sites are free (or a few $ otherwise) to visit. There are plenty of walking tours available for a fee or suggested donation, but it’s very easy to grab a map and walk the red brick route throughout the city and visit the sites at your own pace. Note that most historic sites do close around 4-5pm, but others like Boston Common are always open. Head to Faneuil Hall Marketplace: There is always something happening at Faneuil Hall with live street performers, restaurants, shops, and much more. Free to explore and there’s free events happening often at Faneuil Hall too. There’s also a free historical tour on Saturdays at 11AM from May 27, 2017 to December. Relax and Enjoy Boston Common and The Public Garden: Boston Common is America’s oldest park and the Public Garden was the first public botanical garden in America. They are right next to each other and a great way to spend time whether your spending the entire day there or just passing through! There’s a lot of free and fun events that occur as well, especially in the summer months, including the popular Shakespeare on the Common! There’s also an ice rink in the winter and a carousel and Spray Pool in the summer at Boston Common Frog Pond for an extra fee as well as Swan Boats ($3.50/ride) and the Make Way for Ducklings statute in the Public Garden that little ones love! As a bonus, read the Make Way for Ducklings Book to kids visiting Boston for the first time to get excited for the trip! Relax on the Charles River Esplanade: The Charles River is a great way to spend a beautiful day; run or walk alongside the river for 20 miles, or enjoy a portion of the river. Also, check out the DCR Hatch Shell for free music on Wednesday nights and Free Friday night movies in the summer as well as other events too! Drink for free at Sam Adams Brewery: Take a free brewery tour of Sam Adams, and receive complimentary beer too. Get their early if you don’t want to wait too long, especially on Saturdays. Suggested donation is $2. (Or pay $5 for a brewery tour of Harpoon Brewery or check out their beer hall). Take a stroll at Castle Island: Castle Island is a 22-acre park located in South Boston and is a great place to watch airplanes fly by, walk the dog, jog, or enjoy the sea breeze. You can also grab food at Sullivan’s (not too expensive) or bring food with you to have a picnic. Castle Island is also home to Fort Independence which offers free guided tours on the weekends from between 12-3:30pm and self-guided tours on Thursday evenings in the warm months. Pahk the cah and join the Harvard student-led walking tour: Harvard University offers free one-hour guided historical tours to the public by current students through Harvard Yard for groups smaller than 15. Note: There is another tour through Hahvahd Yahd also led by Harvard students that is not affiliated with Harvard and ask for a suggested donation of $10 per person. There is also another Harvard tour from Harvard’s Admission Office geared towards prospective students. Star-gaze at the Coit Observatory at Boston University: The observatory is open and free to the public every Wednesday night at 8:30pm in the spring and summer and 7:30pm in the fall and winter. This event is weather permitting since the telescopes are outside, so call ahead to ensure the event is happening. Tour and Explore The Boston Public Library: The Boston Public Library offers free art & architecture tours during particular times by volunteers. If you can’t make a tour, you can always do a self-guided tour of the central library. Dive into History at the Massachusetts Historical Society: Discover the collections at this independent research library founded in 1791. Free to visit. Take a scenic stroll on the Haborwalk: Walk alongside the waterfront with the public walkway connecting the best of Boston Harbor. Visit the Institute of Contemporary Art on Thursday Nights: The institute of Contemporary Art is an art museum in South Boston with the mission to exhibit contemporary art. The ICA is free every Thursday night from 5-9pm and free for families (up to 2 adults accompanied by children 12 and under) on the last Saturday of every month (except December). Discover the MIT Museum: The MIT Museum at MIT offers interactive exhibits, programs, and renowned collections. Admission is free all day the last Sunday of every month from September to June and free the first weekend of every month for Bank of America cardholders for Museums on Us. Also free for teachers and Cambridge Public Library cardholders. Head to Cambridge and explore the Harvard Museum of Natural History and Peabody Museum of Archaeology and Ethnology: Massachusetts Residents can visit free with valid ID on Sunday mornings from 9am-12pm year-round or from 3-5pm on Wednesdays from September to May. Visit the Museum of Fine Arts on Wednesday Nights: The Museum of Fine Arts has over 450,000 different pieces of art, and admission is voluntary on Wednesday nights after 4pm and certain days of the year. Also, Bank of America cardholders can receive free admission the first weekend of every month, part of the Museums on Us program. Youth 17 and under also receive free admission daily after 3pm, weekends, and public school holidays. Explore the Commonwealth Museum for free, always: The Commonwealth Museum shares the rich history and treasures of Massachusetts and is free to visit and park. Discover the Boston Fire Museum: The Boston Fire Museum is open and free on Saturdays from 11-6pm with a suggested donation. Note: This is right near the Boston Children’s Museum for an easy before or after stop. Boston Public Library cardholders, explore Museum of Science and New England Aquarium for free with advanced reservation: BPL cardholders can grab a free pass for up to 4 people to visit the Museum of Science or New England Aquarium (no free passes in July & August for Aquarium) with advanced reservation. Even better, any Massachusetts resident can become a Boston Public Library cardholder. Celebrate your birthday at the Isabella Gardner Stewart Museum for free: Visit this art museum on your birthday (or have the name Isabella) for free admission. College students at participating universities may also visit for free. What is your favorite free thing to do in Boston? Thanks for the tip Andre!